The new-generation Honda Amaze has recently crossed the 63,000 sales mark in India, as of December 2018. The car which was launched in May 2018 has achieved this sales milestone in just seven months, with monthly average sales of over 7800 units. The new Amaze has been one of the top performers for Honda ever since its launch competing for the top spot with the Honda WR-V and the City. In fact, back in October 2018, when the Amaze breached the 50,000 sales mark, it became the fastest 50,000 sales number recorded by any new model launched by Honda in India. Designed, Honda says, as a sedan from the ground up, it is aimed at first-time buyers, young families and mature people, who wish to revert to comfortable, reliable transportation.Regarding its looks, Honda’s press splurge remarks on things like “a cohesive, streamlined shape with a flowing silhouette and a strong, individual character, while expressing the current Honda design language”. 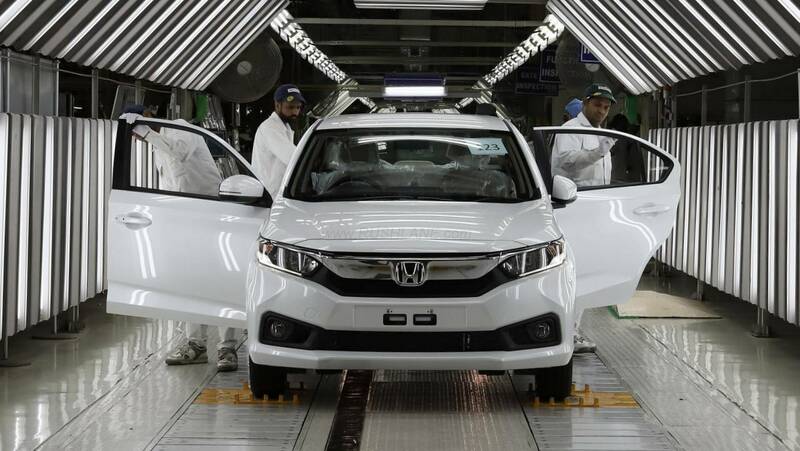 Honda Cars India Ltd. (HCIL) has announced a price increase across its vehicle line-up. The price hike comes into being wef February 1, 2019. Most manufacturers have increased a price hike starting at the beginning of 2019. Honda’s price hike will see the CR-V cost Rs 10,000 more. Other vehicle in the line-up will be dearer by upto 7k. Honda is one of few companies to log a sales increase, it’s a small gain compared to 26 percent sales growth the company reported in December 2017. HCIL reports 315 units were exported in December 2018 down 57 percent from 730 units exported in Dec ’17. Maruti DZire has been a leader in sales, scoring head and shoulders above its rivals such as the Honda Amaze, Hyundai Xcent, Tata Tigor and Ford Aspire all of which are in the sub 4 meter sedan segment. Taking Q1 2018 into account, DZire sales totaled 65,586 units as compared to sales of just 4,485 units of Amaze, 9,331 units of Xcent, 8,094 units of Tigor and 5,124 units of Aspire. Sales of each of these five models increased substantially in Q2 2018 wherein it was also seen that DZire sales far exceed its competition. Maruti Suzuki DZire sales in this period went up to 74,765 units while sales of Amaze stood at 18,892 units and sales of Xcent went up to 11,585 units. The second generation update given to the Honda Amaze is currently doing wonders for the Japanese automaker in India. For the year 2018, this compact sedan was at the top of the list of the most searched cars and has been garnering decent sales for the brand since its launch earlier last year. During the month of December 2018, a total of 5,565 units of this compact sedan were dispatched the the dealers in comparison to 1,415 units during December 2017. When we talk about sedans, they make for a sensible upgrade for most of the hatchback owners in India and it is the largest selling body-type in the whole world, and India is an important market for that as well. As 2018 to an end we decided to compile a list of top 5 sedans launched in India in 2018. Keep in mind, though, that the list is in no particular order as the cars serve to a large number of people with varying requirements. With that out of the way, let's get started. In terms of market share, the Maruti Dzire still has the biggest chunk with 58.77 per cent but that is less than what it had in December 2017. This is thanks to the Amaze, which has slowly been gaining popularity. It currently has a 19.47 per cent of the market share in this segment; Amaze market share in Dec 2017 was only 4.53 per cent. The compact sedan space is growin at an exponential rate, it is without a doubt the largest segment in India. Case in point is made even more apparent when you realize that the Maruti Dzire was Maruti Suzuki's best selling car in 2018, taking the top spot from the Alto. Similarly the new Amaze set new sales records for Honda Cars India with the all-new Amaze bringing back their compact sedan contender into the limelight. The third contender on this list is the Ford Aspire which in our books is the most under-rated in the compact sedan space. In this comparison lets look at how their cabins compare in terms of features. The Indian car market is one of the quickest growing market in the world. The manufacturers around the world are launching their products in the growing market to benefit from the fast pace market. While the market received a wide range of cars that include affordable Datsun Go to the high-end models like Skoda Kodiaq and Honda CR-V. Out of numerous launches, which are the best cars that have been launched in the Indian market? Let’s find out. Compact sedans have long become among the best selling segment of cars in India. While many may call them a design afterthought or a-boot-strapped-hatch, there is no denying the fact that they offer tremendous value at affordable prices. The latest generation of compact sedans are now quite in the game and offer plush interiors and enough boot space. If you were planning to get a compact sedan anytime soon, here are the best offers on them.